If you follow me on facebook or twitter you already know that I've been experimenting with some dragon fruit recipes! It's only appropriate, right? It's fun substituting dragon fruit, if you can find it, for other fruits such as strawberries, pineapple, melon. In the US, Whole Foods will get some dragon fruits imported once a month or so. I found this recipe on Almost Bourdain and knew I had to try it out, the photos don't really do it justice. A jasmine tea and honey panna cotta with a dragon fruit gelee on top! Nom nom nommm. Pour milk into a chilled bowl or pot and sprinkle gelatin evenly and thinly over the milk. Let stand for 5 minutes to soften gelatin. Pour milk into saucepan/pot and place over medium heat on the stove. Heat mixture until it's hot, not boiling, about 5 minutes. Whisking a bit. Add the tea (full bags), honey, 1/4 cup sugar (not shown above), and a pinch of salt. Stir occasionally until honey is dissolved - about 5 minutes - without boiling. Remove from heat, allow to cool. Pour into glass or ramekin. Refrigerate at least 6 hours or overnight. Place fruit and sugar in a small saucepan until sugar is dissolved. 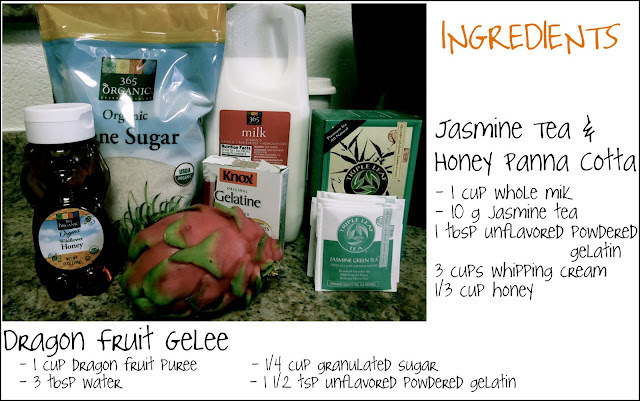 Mix gelatin into dragon fruit mixture and stir until dissolved. Remove from heat and allow to cool, close to room temperature - when layering on top of the panna cotta, a hot mixture will heat up the panna cotta.